Stops friendly NPC's from saying "Stupid Dog!" towards your follower dogs, adopted pet dogs, and dogs friendly towards the Player. Inspired by No More Stupid Dog Comments. Permission granted to reuse assets by the author TheWinterHawk as stated in permission notes on that mod. No More Stupid Dog Comments originally created by TheWinterHawk. Assets and ideas reused by permission as stated in the permission notes on that mod. Speech bubble by pascallapalme used by permission under Public Domain as stated in the licence notes. Smart No more Stupid Dog Comments! Tired of friendly NPC's forever saying "Stupid dog!" to your furry friend? Tired of no-one ever saying anything to your Dawnguard dogs?! 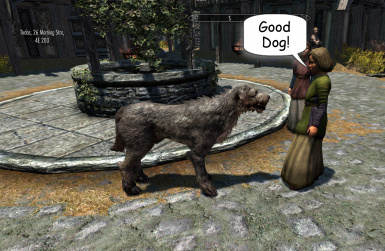 Friendly NPC's (Spouses, Housecarls, adopted children and NPC's with a good disposition towards the Player) will say "Good dog!" to your pet provided the dog is friendly towards the Player. Unfriendly NPC's or those not disposed towards the Player OR if the dog is not friendly, NPC's will continue to say "Stupid dog!" as per normal. Dawnguard version is the same as vanilla version except all Dawnguard faction NPC's (not vampires) are always friendly toward Dawnguard dogs (Bran, Sceolang). Hearthfires version is the same as vanilla version but DLC player home house bards and DLC player home carriage drivers will be friendly to player owned dogs too. Dawnguard+Hearthfires version combines everything, basically. 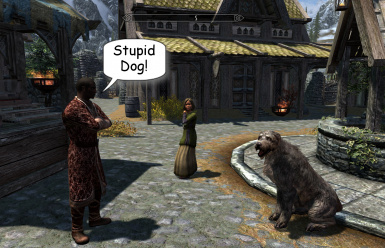 New version released: I finally fixed a couple of things that were bugging me namely Hunter and Dog (WEJS21) and Ardwen﻿ and dog (WEJS13) would still say "stupid dog" to their respective follower dogs. They'll now say "good dog!" to their dogs instead. They may possibly say the same to random other dogs too as theres no easy way to filter out every possibility, this is not a bug. Q: do I need to start a new game to install the update? Q: does this mean they'll say "good dog!" to Player dogs now? A: No, they'll react just the same as always unless they happen to be friends with the Player. "So why did you create this when TheWinterHawk's mod works just fine?! Though his mod works fine it mutes all NPC's who won't say "Good dog!" towards any dogs and it doesn't distinguish between friendly/unfriendly NPC's. Or dogs. Basically if they won't say "Good dog!" they won't say anything at all. Not a word. So I made this mod which makes friendly NPC's and dogs talk to each other as well as unfriendly ones carrying on their same old bad behaviour. Because the world is like that. I made this for myself but if anyone else likes it thats great too. Enjoy. Just install with MO or NMM or drop the files in manually. Use MO or NMM's uninstaller or remove manually. No special steps necessary. Does this mean that NPC's will finally acknowledge my Dawnguard dogs exist? Really?! Is it safe to remove? There are no scripts and nothing is baked into the savegame so it should be safe to remove at any time. How does it work? Does it use vanilla voices?! It does indeed use vanilla voices. All non-unique voices have "Good dog!" lines recorded but you rarely get a chance to hear them, if ever. This mod simply adds extra conditions to the dog dialogue quest so you finally get a chance to hear the already recorded lines, thats it. Its also patched for Dawnguard dogs (if applicable). It should be compatible with anything that doesn't modify dog dialogue. What if its not compatible with x,y,z mod that does affects dog dialogue? If you're lucky I might introduce a patch. No guarantees though. So be nice, ok? Is it compatible with your other mods especially Improved Adoptions? Absolutely! It wouldn't be much use if it wasn't! It was originally conceived as part of that mod but I decided to make it a separate mod so everyone can use it. Can I use this mod instead of WinterHawks? Will it cause problems? Nope, it shouldn't do. Just uninstall and use this one instead. Should I use both at the same time? No! Use one or the other. Does it work with Hearthfires adopted kids? I'm sick of them saying "Stupid dog!" right after they asked for a pet! Yep, me too. It should do, if not there something up with their faction i.d.'s. Is it compatible with mods that add extra pet animals? To be honest I'm not sure. If they don't touch vanilla dog dialogue probably, otherwise I really don't know. for those who want NPC's to talk to Sceolang or Bran. So why can't you make NPC's and their follower dogs say "Good dog"? Why just the Player? "Good dog" dialogue is dependent on disposition and it's not changeable for non persistent actors or at least would require modifying a number of vanilla quests with the resultant compatibility issues that would likely ensue. It'd also require scripts. Help! They're still saying "Stupid Dog" to Meeko / other dog! Whats going on? Should I use this one as well as WinterHawks? Nope! Just one or the other. Not both. Yes it ought to be safe to remove one and use the other.